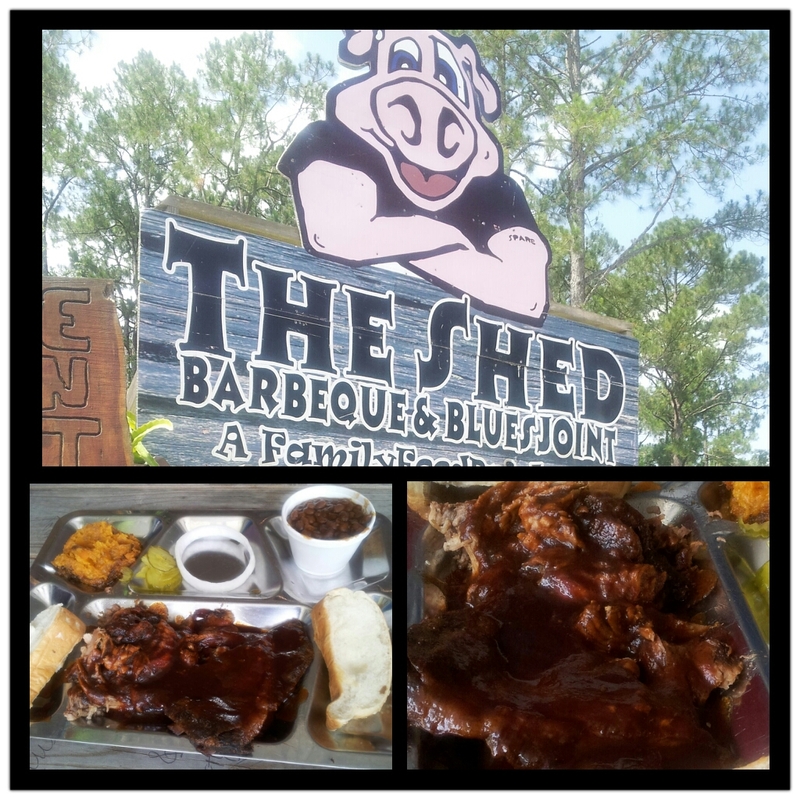 The Shed Barbeque & Blues Joint, 7501 Hwy 57, Ocean Springs, MS. Two more locations: Gulfport, MS and Mobile, AL. A pleasant surprise on the first day of my 6 week road trip, the stars aligned for me to have lunch at The Shed in Ocean Springs. A tasty treat awaits right off of I-10, Exit 57 in Mississippi! My first impression ….what the heck is this crazy place?! It wasn’t your typical BBQ joint, nor was it a typical day. You see, the Food Network had production going on shooting the promos for their new show, “The Shed” featuring the family and sidekicks. Do to production, customers had to eat outdoors. It was a hot day and buggy, but not terrible. I ordered the Shed combo, 2 meats (pulled pork and ribs), 2 sides (beans and sweet potato casserole), 2 bread. It arrived on a stainless steel divided tray, reminiscent of a school cafeteria…or a prison. Ha! Very cool idea, nonetheless. The baby back ribs were good eats, but the pulled pork was the star! Smokey, tender, saucy yumminess. I don’t think you can go wrong with any of their side choices. The baked beans were rich and hearty and the sweet potato casserole was so delicious, almost like dessert, I wanted more. Awesome meal, deserving of a happy dance! The staff, owners/family are all on-point, kind and welcoming. The restaurant and property are entertaining in itself. I look forward to returning, next time I’m on I-10. 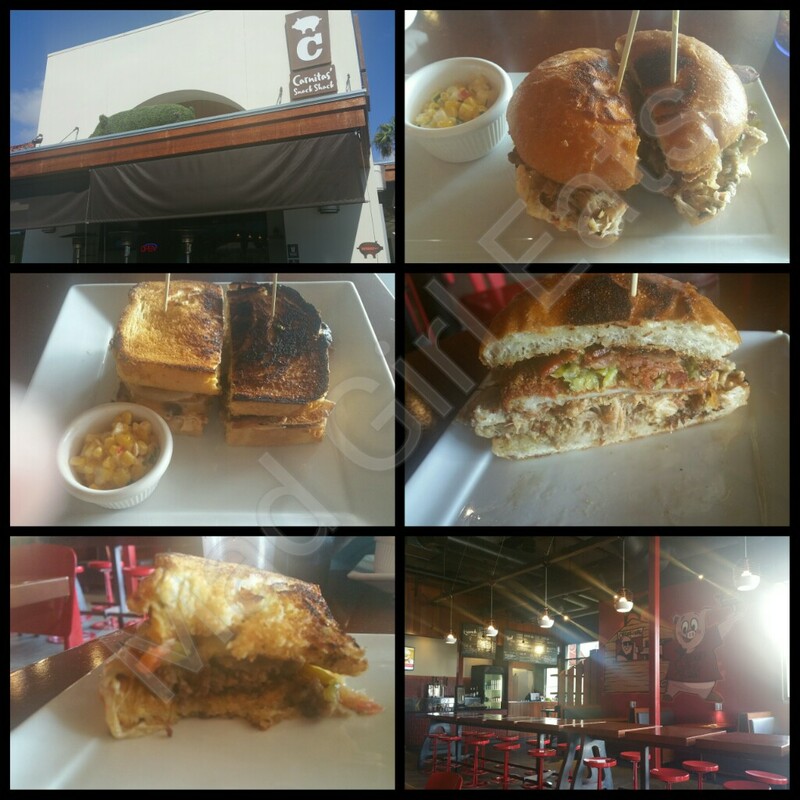 As seen on the Food Network, Diners, Drive-Ins, and Dives, and the Travel Channel, Man vs Food Nation. Hours: Sun-Thurs 11am-9pm, Fri-Sat 11am-10pm. On-site parking. 4.5 out of 5 sweet and saucy smackaroos. I attended the Great American Pie Festival in Celebration, FL. Did I indulge in the all-you-can-eat Pie Buffet? Heck no, I had BBQ! Stuck in my love of Kansas City bbq, I was never drawn to Carolina or Alabama style. Never a quitter, I knew it was time to try. 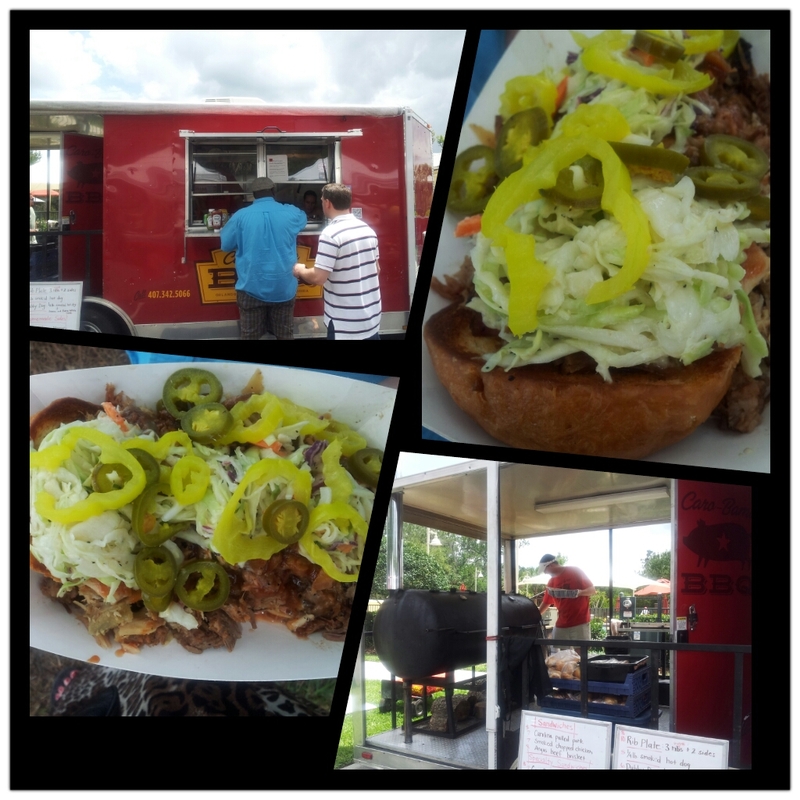 I’ve been anticipating the first bite from the Caro-Bama BBQ food truck since I read about it on Twitter. The timing was never right for me to catch up with them until they participated at the Great Pie Festival. Nothing was more appropriate to order than the Kitchen Sink. I wanted to try it all and taste everything. This was it! A mix of pulled pork, beef brisket, pulled chicken, bbq baked beans, coleslaw, Sweet Home Sauce, Bama White Sauce, banana peppers, jalapeno, all on a delectable open bun. *Take a breath. That’s a big load! OMGeez Louise. This was incredible…you could hear moaning by the lake (sorry) ha 😉 This hit every salivating note and flavor you’d want in your bbq. Meats were spot on tender and smoky and the addition of baked beans and coleslaw was sinfully good. Send it over the top, the peppers added a kick if you need it, and their sauces…..you know I’m a sauce junkie and these gave me a happy high. Bama white sauce is a creamy tangy bbq sauce from North Alabama and the Sweet Home Sauce, another Bama fave, has a sweet tomato-base. Just hook a BBQ sauce I-V up to me now. They have 5 sauces to choose from, so pick your delish poison and get on with it! I can’t wait to eat thru the entire menu. Doesn’t look like a bummer in the bunch. If you’re in Central Florida, find this truck. I mean it, find it! http://caro-bamabbq.com for their schedule. The Smok’n Pig BBQ, 4228 N. Valdosta Rd., Valdosta, GA. 31602. Road trippin’ on Interstate 75 in southern Georgia, I found a gem right off the freeway for a tasty meal. If you’re tired of the Drive-thru, bag full of crapola, cross the street to a happy place. Southern bbq! 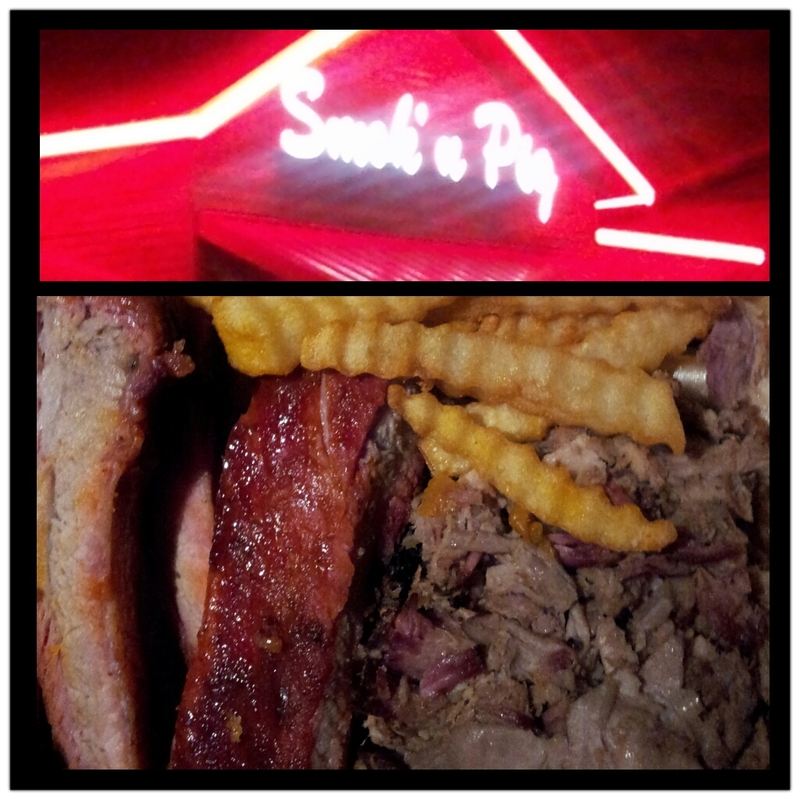 I ordered the Smok’n Pig Combo, choose 2 meats from 4 offered (I picked the St. Louis ribs and pork) yum. It’s a nice dinner with bread and 2 sides. I chose french fries and baked beans. Yay on the fries, nay on the beans. The meat however, freakin’ fantastic. Good bbq sauce as well. Great spot not far off the I-75. Large full service seating area or take out. If you’re going to eat it on the road and don’t have someone feeding you, get a pork sandwich. Easier eats and not as much sticky sauce hazards. 4 out of 5 smok’n savory bites of porky pig. Oklahoma Joe’s, 3002 W 47th Ave, Kansas City, KS. I know good bbq. 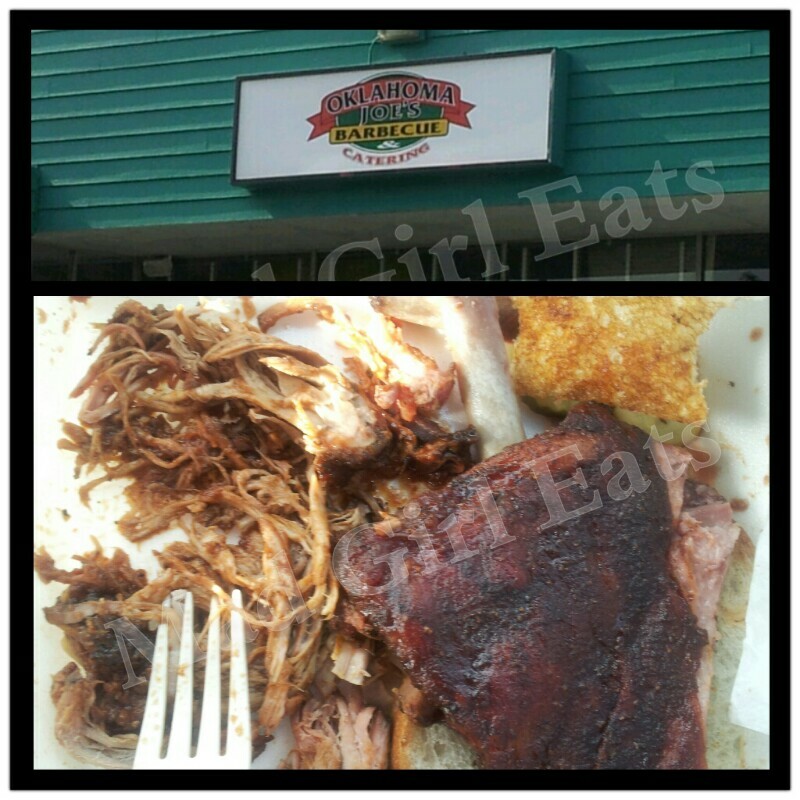 I’ve been a lucky girl to be able to try bbq from around the country. Different regions have their own take on bbq and I must say, Kansas City rocks my world hard! 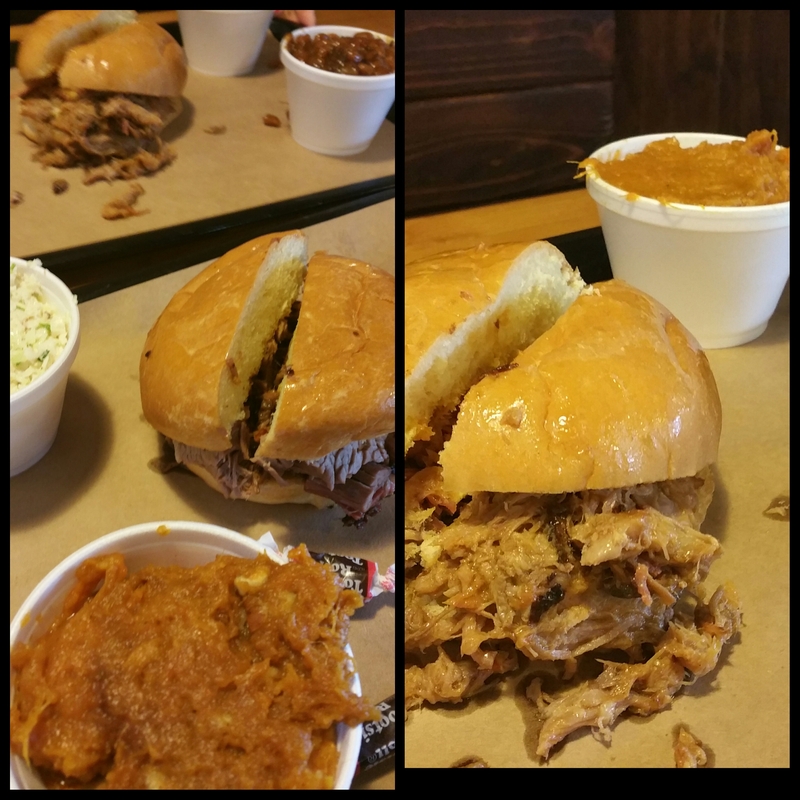 I have tried my fair share of bbq restaurants in the Kansas City area and Oklahoma Joe’s is tops…by far! One of the best bbq joints in all the land is unequivocably, Oklahoma Joe’s. THE BEST RIBS I have found at a restaurant thus far. Really great quality food with everything you want in a bbq meal. Their spicy coleslaw was beyond…such a nice surprise. The pulled pork, aces. But the ribs will make you stand up and U-RAH-RAH! I want to taste the meat and enjoy the smoke. If you’re going to rag on some barbecue sauce, it better be phenomenal or you can easily ruin the meal. Oklahoma Joe’s has incredible bbq sauce. They have it bottled for your home enjoyment so grab some before you leave. I didn’t and I regret it. Seen on Man vs Food, Anthony Bourdain’s No Reservations, and Food Paradise. Tip: Located on the corner in a gas station. Gas up, then gas up. The beans are bangin’ good. Ha! 5 out of 5 perfect bites of extraordinary bbq. I came into Texas, not a big fan of beef brisket. It being the star of Texas bbq, I knew I better give it a try. I stopped at Rudy’s Country Store and Bbq, ranked high on local best restos. I ordered their moist brisket, a sausage, and Rudy beans. The sausage was nothing special, beans were good, but the star shone in their brisket. Major yum factor! Ask for some burnt ends also, so outstanding..they would have made Guy Fieri moan 😉 As I pass over the state line, I am leaving Texas a new fan of beef brisket. Big flavor. But they do everything big in Texas. Rudy’s gets 4.5 out of 5 on the smootch-o-meter..for bbq beef brisket. Giddyup!